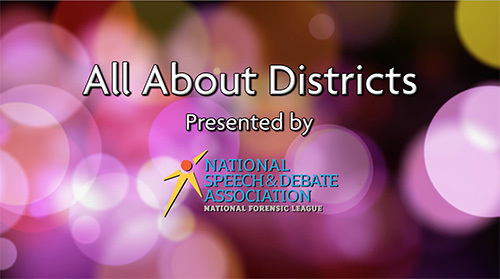 We hope these resources serve as a one-stop shop for what you need to help grow speech and debate in your area, communicate with the coaches in your district, and run a successful district tournament. Please feel free to contact our District Support Manager Erik Dominguez with any questions you may have. Read the most up-to-date district tournament operations manual starting on page 57 of the High School Unified Manual. Find other district tournament forms online. 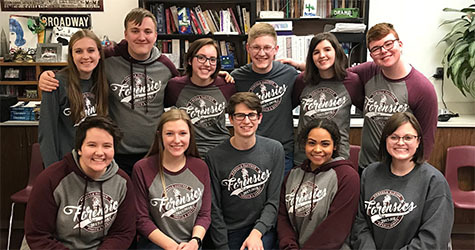 Learn about the suggested roles each member of your District Committee can play. Download this guide for instructions on setting up your district tournament on Tabroom.com. Check out this Building Community guide with core elements and resources for creating a team with teams. Get an introduction to 501(c)3 status at the district level by reviewing this presentation from the 2017 National Conference Leadership Track. View and/or pass along the judge training course developed by the NSDA and the NFHS. Be sure to register your district tournament on Tabroom.com, even if you are not using Tabroom.com as your tournament software. Any district that runs any portion of the district tournament series between August and December must register their district tournament dates by October 31. All other districts must register their district tournament dates by November 30.